Ever wonder about some of the systems or problems commonly found in homes? Here are some of the ones that I encounter. Buying or selling a house can be a stressful life event for both the buyer and the seller. You finally find that perfect home and are sitting down with your agent to write an offer. You get to the section pertaining to home inspections and whether or not your offer is dependent upon an inspection. In any cases, this is the time your agent will tell you directly or hint at the fact that they don't believe you need a home inspection. Why does this take place and why can home inspection be such a touchy subject? One reason is that in real estate, agents do not get paid until the home sells. Another reason is that agents are the standing the middle ground after a home inspection, between the buyer who may want certain items repaired or price reductions for these items, and the seller who neither party wants to make angry feel offended. This can be a fine line to walk and can make for some very uncomfortable conversation for the agents involved. Wouldn't it be great if we had the home inspection report before written offers are made? This is where seller's inspections come in to play. Most people don't consider getting an inspection done on their home when they sell it, because home inspection has always been primarily an activity that takes place during the finalizing stages of a purchase and by the buyer, not the seller. There is nothing that says this has to be the case. Home inspections can be performed by the seller at listing of the property. The reports can then be given to the potential buyers when they look at the home. Not only does this smooth over some of the stress of the purchase transaction, it also projects a feeling of honesty and transparency to potential buyers. -Is the inspector honest and straight forward when reporting on the condition of the home? You would not want an inspector that is "helping" the agent or seller in portraying an image of the home that is not what is visibly evident. Home inspections should always first and foremost be a report on the conditions evident at the time of the inspection, irregardless of who is involved in the transaction. -Is the inspector friends or family with the seller or agent? This can be a tough question particularly in smaller, more rural markets where everybody knows everybody else. These smaller markets are great in that as everybody gathers at local sporting events or community activities there is a real sense of togetherness and friendship, but in many cases everybody involved is an acquaintance of each other. In this case the honesty and integrity of the inspector and the knowledge that the inspector is going to report on the conditions evident at the time of the inspection no matter what are what will need to rule the day. -When was the inspection performed and has anything changed or been altered since then? Remember a home inspection is a snapshot in time, and that time is the moment the inspector viewed the conditions only. Because of this it is important to consider what has changed since the inspection report was written. So in a nutshell, a seller can schedule an inspection with Sodak Elite Home Inspections. I will then inspect the home and give an honest and straight forward report on the conditions evident at the time of the inspection. The seller can then give the report to as many people as they would like to review it prior to making an offer. I will also leave with the seller or seller's agent a supply of business cards to give to prospective buyers, who can then call me if they have questions. In all instances that I have performed a seller's inspection the seller and buyer were both very happy with the bit of simplicity that was added to the transaction. ​ So if you would like a seller's or buyer's inspection you can find the contact information for Sodak Elite Home Inspections on this website for more information. Our area is all in the high radon risk category. So you've heard of radon before, but really haven't been that concerned about it. It's one of those things that probably never crosses your mind until you go to purchase a home and some home inspector asks you if you want a radon test. You probably thought at that moment, "everything seems fine to me, there seems to be no reason to pay for a test". Before you make that choice, let's take a minute to talk about what radon is. Radon is a colorless, odorless, tasteless, radioactive gas. It is the only gas that is considered to be a health hazard due to it's radioactivity. Radon is considered by the United States Surgeon General to be the second leading cause of lung cancer, behind smoking. So where does radon come from then? Radon is a naturally occurring chemical element that is radioactive, colorless, odorless, and tasteless. Radon occurs naturally as radium and uranium decay. The decay product resulting is radium. The decay product resulting from the decay of radium is radon. Now that we have discussed what radon is, how do we test for it? There are many ways to test for radon, and even more types of equipment and specifications for that equipment. It can be mind boggling to try to learn about how equipment works and the different test methods. The two most commonly used test methods for testing radon in the air are the use of charcoal canisters, or continuous electronic monitors. It is not feasible for most people to own a continuous electronic monitor due to the very high cost of these monitors. 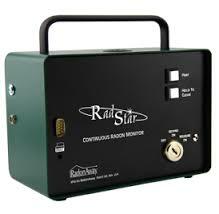 Electronic radon monitors are expensive, require annual calibration, and require specific training to use. Charcoal canisters are cheaper, but accuracy may not be to the same level as electronic monitors, and the test results take longer to get. Radon testing professionals use electronic monitors for this very reason. At Sodak Elite Home Inspections, I use the latest, state of the art monitors from Accustar Labs and have the equipment calibrated every year. This way you know that you are getting accurate results. There are two other important factors in radon testing. They are short term or long term testing. A short term test is a test of 48 hours to 90 days. A long term test is a test that lasts for longer than 90 days. 48 hours is the minimum length of time that a radon test can be performed in. So you are now ready to test for radon either with your home inspection, or without. What do you do? First, contact me to set up a date and time. When performed along with a home inspection I personally prefer to install the radon monitor 48 hours or more before the inspection, so that the radon test results are done at the inspection and you can get your inspection report and radon report all emailed at the same time. Then I will set the radon monitor up in the lowest occupied level of the home being tested and turn the monitor on. 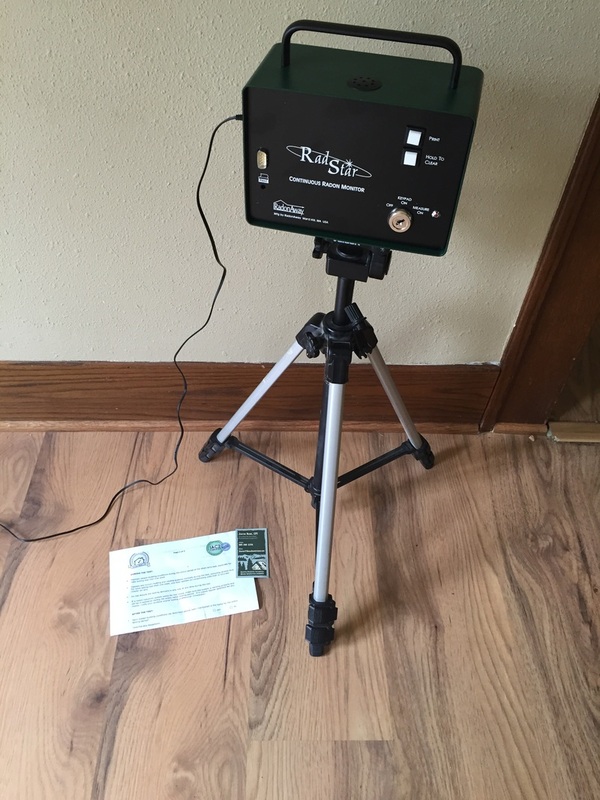 A radon test is performed in closed house conditions. This means windows and doors are to remain closed, other than using the door for normal passage into and out of the house if it's occupied. While the radon monitor is in use it will know if the windows were opened, a fan was blowing through the house, or if it was bumped or otherwise tampered with. Leave the monitor alone, and let it do it's work so that you get the most accurate results possible. Now we have results. I as the IAC2 certified radon testing professional, will take the monitor back to my office and connect to the results and report software to generate a report that will be emailed to you. Instant results of the average can be printed on site during the inspection, with the full report to come later. The U.S. EPA recommends radon levels not be above 4 picocuries/liter. If the results show a level above 4 pCi/L and it was a short term test, the recommendation is to either perform another short term test to validate the results, or perform a long term test to get a more accurate representation of the radon in the home. Mitigation is recommended for radon levels above 4 pCi/L. So that's how radon testing works, in a nutshell. In the future I will cover mitigation systems and some of the ways that we lower radon levels inside a home. For now, remember to test for radon, and be certain to hire an IAC2 certified inspector to do the test. That way you know you are getting reliable results. Spring is almost here.... Barbecue safety. 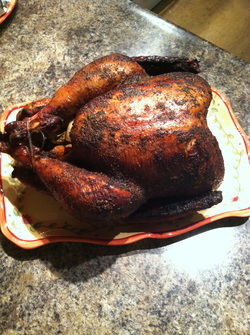 Mix it all up, put a little but under the skin of the bird, throw some olive oil or vegetable oil on the outside of your particular favorite poultry, then sprinkle more of the rub on the outside. Don't be shy with this stuff, it's delicious. Put the meat on a grill running about 350 or so and cook until your trusty meat thermometer says 180 in the thigh or 160 in the breast. Don't overcook that chicken!!!! That's what makes it dry. Once it's done, cover it with foil for 20 or 30 minutes to rest, then invite friends. I'm not an author at all but will attempt to provide some valuable information about your home.